Sorry! Blue Willow is no longer offering Service Dog Coats! I got Bug's coat and it is *by far* the most well-made piece of clothing ever. (And I have a LOT of dog clothes.)" A walk in the snow is not so bad with a warm winter coat on! All of our coats are custom-made to your measurements. 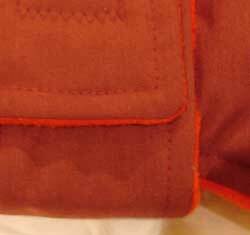 We craft both heavy winter dog coats and lighter weight autumn and spring dog raincoats. 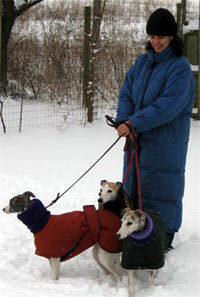 Make a dog happy: order a coat today!